Charles M. Salter Associate, Inc.
A world-renowned hospitality chain began redesigning the ballroom of one of their hotels in 2011. One of the issues that needed to be addressed was significant noise resulting from cars traveling in the garage located directly above the ballroom. Items suspended from the structural slab visibly shook, while the suspended plaster ceiling and other loose elements generated significant rattling noises in the ballroom. Working with the design and construction team, Charles M. Salter Associates, Inc., developed an isolation system that significantly reduced noise levels and vibration of the elements supported by the ceiling. The scope of the ballroom renovation included replacement of all architectural finishes and new mechanical and electrical systems. The new design also included an open ceiling exposed to the lightweight concrete parking garage deck above. The ballroom needed to accommodate a wide array of events (e.g., weddings, trade shows, presentations, meetings, etc. ), and flexibility of the space was a priority. To support a variety of suspended items, a steel grid system was designed. This versatility allowed for temporary items such as lighting, speakers, and signage to be set up virtually anywhere in the ballroom. This grid was also engineered to support other permanent elements (e.g., chandeliers, conduit, piping, and ductwork). Though removal of the original ceiling eliminated a significant source of noise, there was still a concern for rattling infrastructure elements that needed support from the garage slab above. To address this concern at the steel grid, we worked with the structural engineer to incorporate spring-isolated connections to the parking garage slab above. This allowed the garage slab to move independently of the grid below, reducing noise levels in the ballroom. Two types of spring isolators were selected based on their location and expected load. Existing supports that remained from the original construction were also retrofitted with spring isolators. 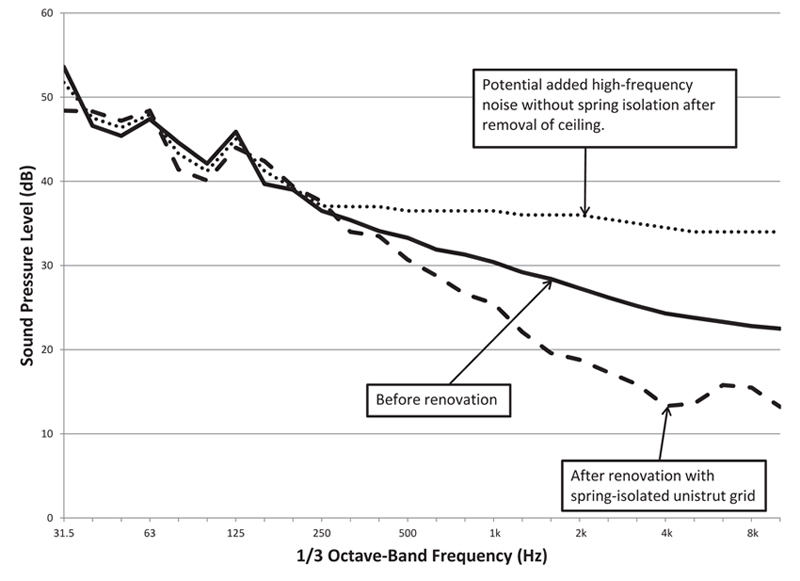 In the end, high frequency noise levels associated with rattling items were significantly reduced from the pre-renovation conditions as shown in Fig. 1. The client considered the project to be a success. Fig. #1: Noise spectrum of car pass-bys before and after renovation.